Inspired by the stunning turquoise lakes of the Rocky Mountains, the beautiful Moraine Blue 2018 Range Rover Evoque SE Dynamic Landmark Edition is a true head-turner. Land Rover Colorado Springs is excited to have one of these unique vehicles in our inventory! The Landmark Edition is a true celebration of the success of the Range Rover Evoque and offers stunning features including Ebony leather seats with Light Lunar stitching, Carpathian Grey panoramic sunroof, Ebony headliner, Dynamic Body Kit -Graphite Atlas grille, fender vents and tailgate lettering, a dark gray-brushed satin center console and unique 19-inch Gloss Dark Grey 7-spoke alloy wheels. Enjoy top-of-the-line design, comfort, technology and safety features on this beautiful crossover SUV including Cold Climate Convenience Package (a suite of handy heated features on everything from windshield to seats), Premium Interior Protection Storage Pack, an efficient 2.0L turbocharged I4 engine, HD radio, chrome wheel locks, front and rear fog lamps, back-up camera, front and rear parking sensors, power liftgate, Brake Assist, superior handling with automatic full-time four-wheel drive, and much more! 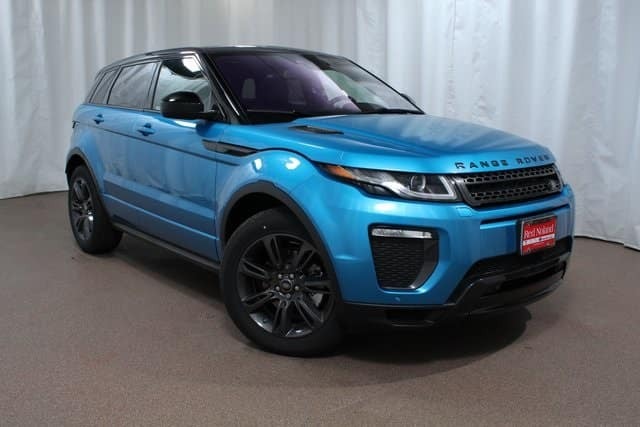 Contact Land Rover Colorado Springs for more information on our stylish 2018 Range Rover Evoque SE Dynamic Landmark Edition SUV before it disappears from our inventory!